Camille Fauré was the best of the French enamelists. 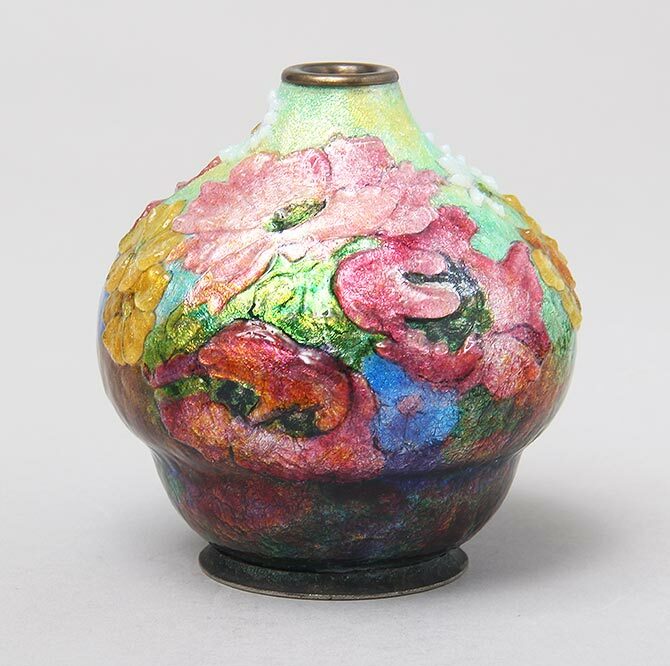 He's famous for his Art Nouveau and Art Deco floral and geometric vases. 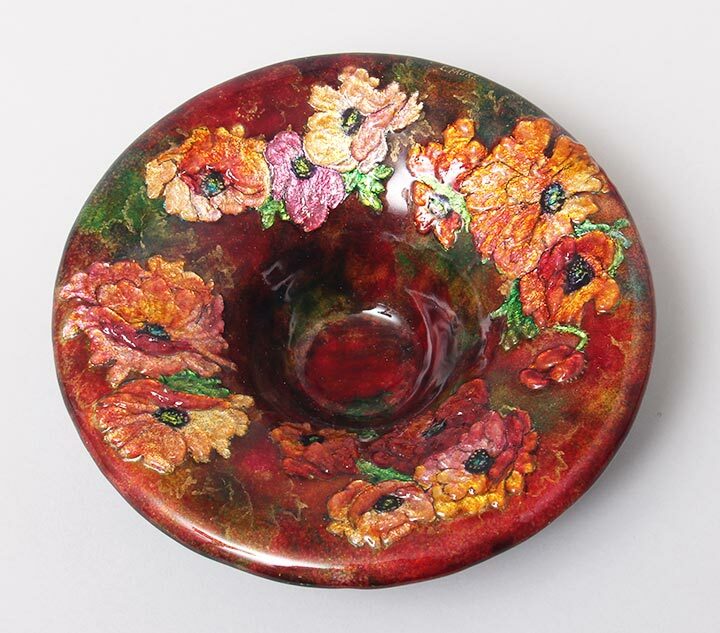 This lovely example is a beautifully detailed Art Nouveau floral dish, with exceptional color. 7" diameter. Signed. Mint condition. 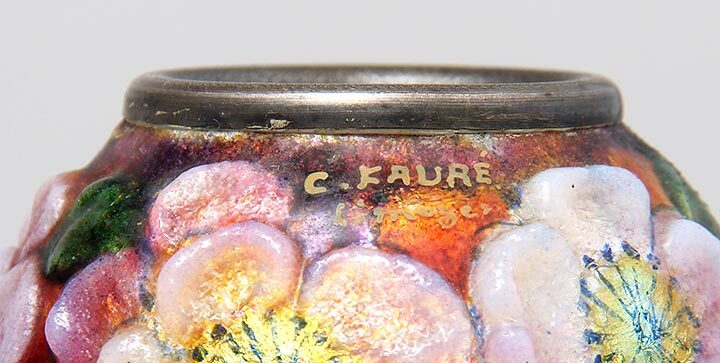 Camille Fauré was the preeminent French enamel artist. 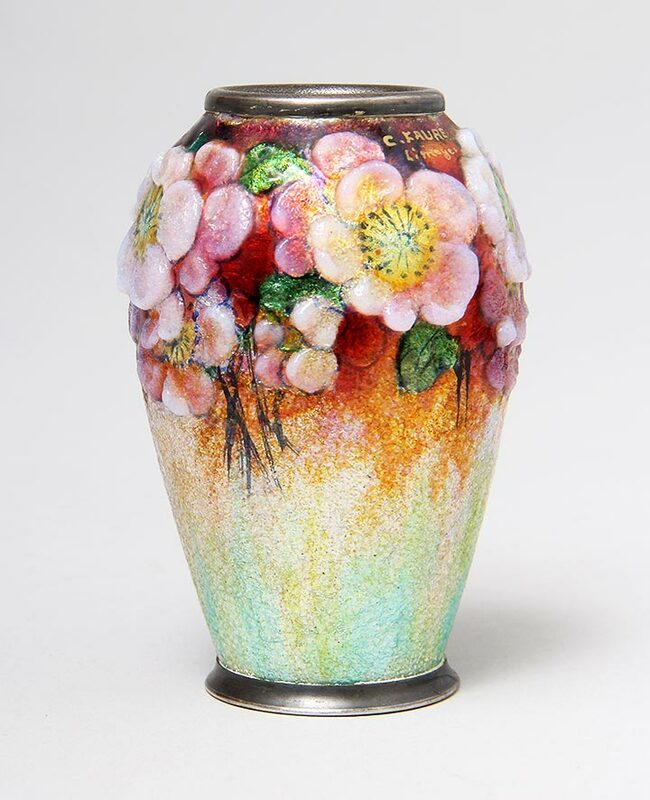 Early in the 20th century he created beautiful copper vases with raised, three-dimensional enamel flowers. This example is gorgeous with vivid, colorful flowers. Mini-sized at 3¾" tall x 3½" diam. Gilded signature along the foot rim. Mint condition. Camille Fauré was the best of the French enamelists of the 20th century. 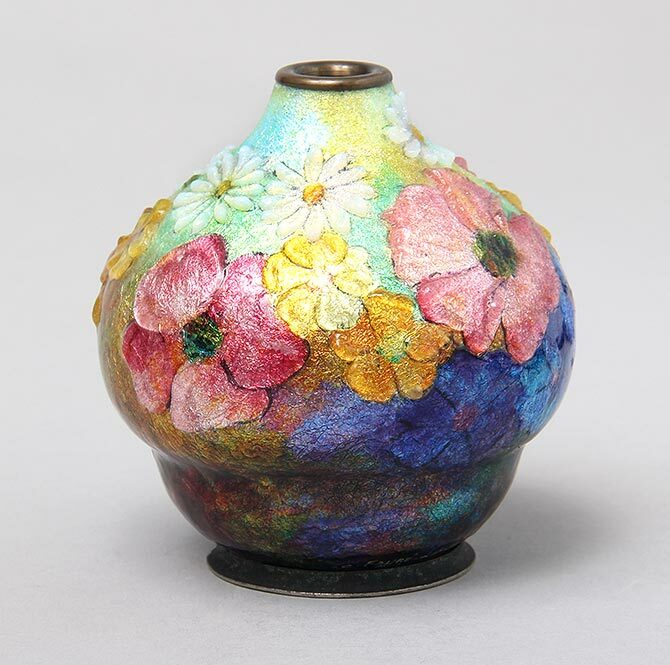 This little mini vase, 3½" tall, is a fine example of the earlier Art Nouveau vases. (Fauré is also well-known for his later Art Deco work.) The delicate little pink flowers are highly raised and finely detailed. It's a little beauty! Signed. Mint condition. The myth of Leda and the Swan has been the subject of innumerable works of art. 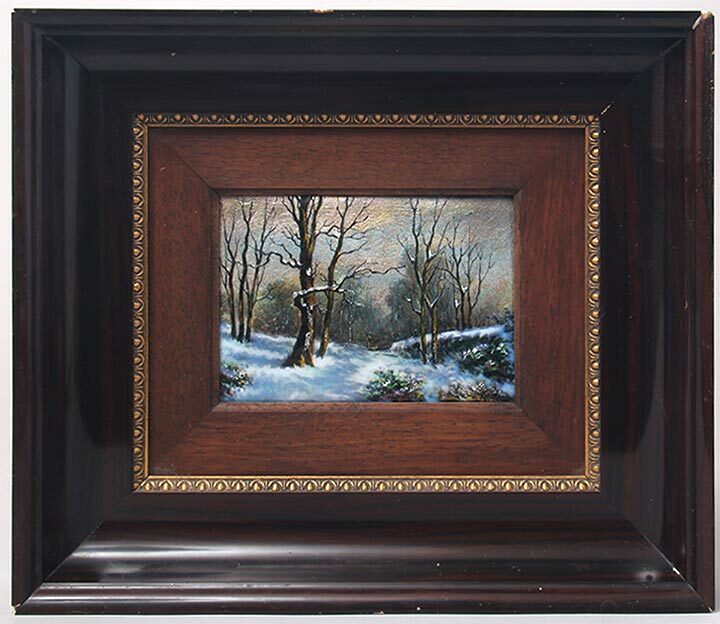 This stunning example is enamel on copper, in the original silk covered frame. The artwork is truly superb. 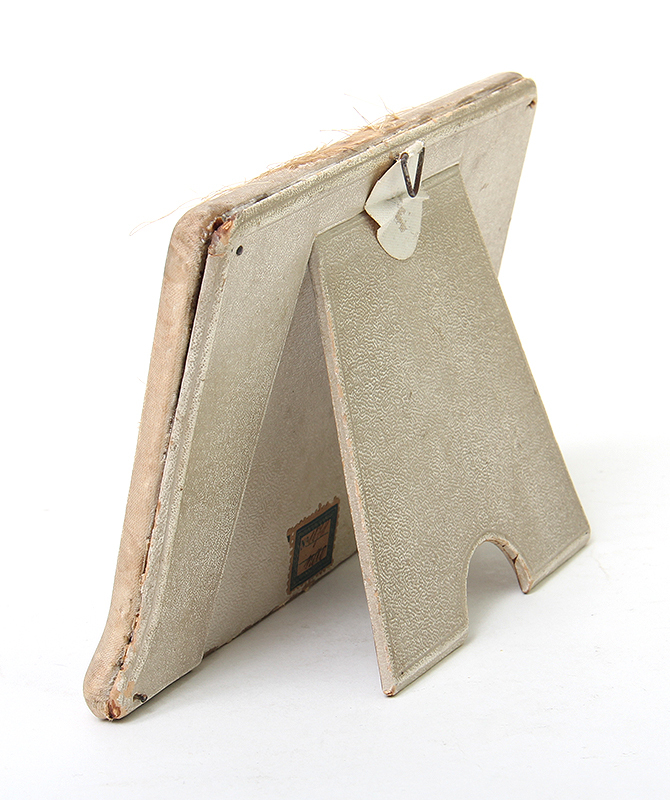 The plaque measures 3½" x 5½" + the frame, which has a stand in the back. The condition of the plaque is mint. The frame has substantial fraying to the silk. Unsigned, but obviously by a superb artist.